When it comes to the comfort in your home you need a terrific heating and air conditioning system to keep you warm or cool throughout the year. Quality Air Heating and Air Conditioning is the company that you can trust to provide you with the high quality heating and air conditioning service in Worthington, OH that you deserve. We offer comprehensive installation, repair, maintenance, and replacement service for many different types of systems including furnaces, central AC, heat pumps, ductless mini splits, geothermal systems and much more. Quality Air Heating and Air Conditioning is a full-service heating and air conditioning company in Worthington, OH that does business differently than our competitors. Instead of settling for just “good enough” work, we treat each of our customers like our friends or family members. We do this because we know that your home’s comfort is important to you. That’s why we’re available 24/7 for emergency heating and air conditioning repair in Worthington, OH. Call us anytime and you’ll always get a live person on the other end of the line. Heating is a big deal here in Ohio, and you need to have the confidence that when the mercury drops your furnace, heat pump, or ductless mini split can handle the cold. 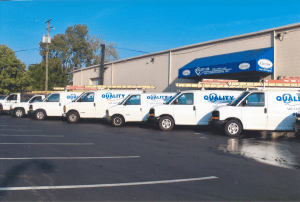 From installation and repair to maintenance and replacement, call Quality Air Heating and Air Conditioning for heating system service in Worthington, OH. If it’s repairs that you need, our experts can fix any issue that you’re having. For new installation, we’ll help you find a great system that matches your home’s needs and your budget, so call us today. Winters here in the Buckeye State can be long and your heater can start to break down from all the use. If your heater is blowing cold air or if it has started making strange noises, don’t hesitate to call Quality Air Heating and Air Conditioning for heating repair in Worthington, OH. We often see homeowners that wait too long to call us for service and it ends up causing more damage to their system. We can work on a large range of heating systems and we are available 24/7 for emergency heating repair in Worthington, OH as well. One of the most common causes of heating problems is poor installation. This is because your heater is a complex piece of equipment that has many different moving parts, safety features and components that need to be connected and calibrated properly. Quality Air Heating and Air Conditioning offers fast, high quality heating installation in Worthington, OH for many different types of systems including furnaces, heat pumps, ductless mini splits and more. Call us today to find out more. When the weather heats up, you turn to your air conditioner to keep you nice and cool. But if it’s time to replace your air conditioner or if you need any kind of repairs, Quality Air Heating and Air Conditioning is the company to call for all your air conditioning service in Worthington, OH. Whether you have a central AC unit, a heat pump, ductless mini split air conditioning, or any other type, our experts can repair it or install a new system for you. We’re available 24/7 for emergency air conditioning service in Worthington, OH so call us anytime. Don’t let problems with your air conditioning system keep your home from being comfortable. Call Quality Air Heating and Air Conditioning for air conditioning repair in Worthington, OH. If your air conditioning system is leaking water, blowing cool air, making strange noises, or covered in ice, our technicians can get your AC back up and working again fast. We respond quickly to your call and we’re available 24/7 for air conditioning repair in Worthington, OH, because we know that you can never plan on when your AC will break down. Don’t risk the future of your home’s comfort and efficiency by having your new air conditioner installed by an unlicensed professional. Here at Quality Air Heating and Air Conditioning, we offer total air conditioning installation in Worthington, OH for all types of systems. We can also help you pick out your new AC system which can help ensure that you get the right sized air conditioner. Call us today to talk with one of our air conditioning installation experts if you’re ready to replace your current system or if you need a new AC unit in your home. You probably take your car to your mechanic regularly for oil changes and tire rotations. The same principle is true for your air conditioning system. Getting regular tune-ups and maintenance is a great way to keep your AC operating at peak efficiency and performance. Quality Air Heating and Air Conditioning offers terrific air conditioning maintenance in Worthington, OH for all types of systems. Our maintenance program includes regular visits, discounted pricing, extended warranties, priority service and much more for our members. Call us today to learn more. Keeping your business comfortable at all times is essential to your success. If temperatures are too hot or too cold, it can negatively affect your business. Quality Air Heating and Air Conditioning offers a comprehensive lineup of commercial HVAC service in Worthington, OH for all types of commercial equipment. If you need a new system installed in your business, let our experts help you pick it out and then install it quickly. We also offer 24/7 emergency commercial HVAC service in Worthington, OH in case something happens after hours and you need a technician. Contact us anytime and you’ll always get a live person on the other end of the line. Commercial HVAC systems get a lot of use keeping customers, employees, tenants, and clients comfortable. All that use can cause them to break down. If your HVAC system isn’t producing enough heating or cooling, or if it’s making unusual noises, just call Quality Air Heating and Air Conditioning for commercial HVAC repair in Worthington, OH. There are a lot of different types of commercial HVAC equipment on the market and our experts can work on all of them. Call us 24/7 for emergency commercial HVAC repair in Worthington, OH as well. Buying new HVAC equipment for your business is a big decision. You’re likely going to be spending a pretty penny on your new system and it will hopefully last you for a long time. Because it’s such a big purchase and also an integral part of your business, let Quality Air Heating and Air Conditioning handle the installation. Poor installation is one of the most common causes of HVAC problems, so give us a call today if you need any commercial HVAC installation in Worthington, OH. We can help you pick out a new system if you’re unsure of which kind of equipment is right for your business. Call today! If your HVAC system at your business is starting to fail more frequently, if it’s operating less efficiently or if it won’t start up, call Quality Air Heating and Air Conditioning for commercial HVAC replacement in Worthington, OH. If you’re not sure which type of system you should get, our experts can help you find a new one that matches your business’ needs as well as your budget. We can also recommend a different type of HVAC system if you’re curious about other types of equipment. Call us today to talk with one of our friendly technicians. If you want to keep your heating and air conditioning system operating properly, regular maintenance is critical. Quality Air Heating and Air Conditioning offers commercial HVAC maintenance in Worthington, OH for businesses of all types. Our maintenance program includes regular visits from our experts, during which they will inspect your entire HVAC system for any problems that could be developing. Our maintenance program members also get reduced pricing, extended warranties, priority service and much more. Heat pumps, as their name implies, move heat from one place to another. In cooling mode, they absorb heat out of your home and then exhaust it outside. In heating mode, they do just the opposite: they absorb heat from the outdoor air and then move it into your home. If you need any kind of heat pump service in Worthington, OH give us a call. We offer comprehensive service for all types and brands of units including installation, repair, maintenance, and replacement. Furnaces are a terrific heating option and one of the most popular in the country. They are incredibly reliable and they’re also very efficient. Quality Air Heating and Air Conditioning is the place to call for high quality furnace service in Worthington, OH. Our experts can work on all types of furnaces, including electric, gas and propane systems. If you need a new furnace installed, our technicians will help you pick out a new one that matches your home’s needs and your budget. We’re available 24/7 for emergency furnace repair in Worthington, OH so call us anytime.